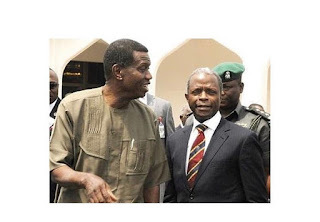 As usual, the Nigerian OAP strikes again, and this time is to tackle the statement made by the Vice President of Nigeria which stated that the General Overseer of the Redeemed Christian Church of God (RCCG) Worldwide, Pastor Enoch Adejare Adeboye was what saved him from the recent helicopter crash. "Miles Monroe must have been praying to the devil then, abi? He asked how the campaign was going got me. "We came in very late from Akwa Ibom State. In fact, we arrived just in time for the grace at the end of the service. He said “Lord God Almighty, I want you to protect this man,” He said it three times and paused, then he continued. “You know how very dear he is to my heart. . So, when the crash happened, immediately it dawned on me that the Lord God had led him to say that very special prayer"